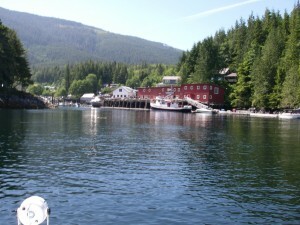 Telegraph Cove is a tourist destination on the north East Coast of Vancouver Island. It is a two and half-hour drive from Campbell River but more important it is often our bathroom stop while whale watching. It has nice clean restroom and also great coffee or hot chocolate. Depending on the location of mornings viewing we normally arrive there around 11:00 or 11:30 for a break and then return to the water and our picnic lunch and continued marine wildlife viewing. 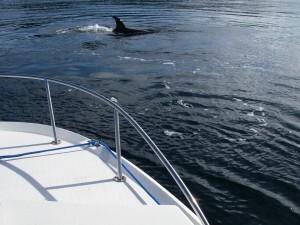 On days when the killer whales are feeding it is not unusual to have them come close to the boat. Sitting quietly in one position if that position happens to be over a school of salmon makes for an interesting viewing. 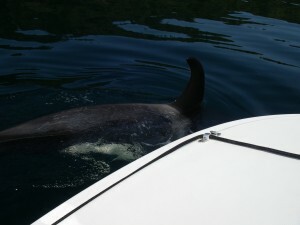 This orca choose our boat as a base and swam around and under the boat several times while catching salmon. Some days are golden in the case black and white. The northern resident orcas appear in the area of Johnstone Strait in late June and remain until mid October. They are the fish eating orca and their appearance coincides with the arrival of the Chinook salmon. The Chinook salmon, Oncorhynchus tshawytscha is the largest species in the pacific salmon genus. Other commonly used names for the species include king salmon, black mouth, Quinnat salmon, spring salmon and Tyee salmon. Chinook salmon are big fish! They are the largest Pacific salmon species. On average, Chinook salmon are close to a meter (3 feet) long and 8 to 14 kg (20 to 30 pounds). But some Chinook salmon in this area can grow to over 25 kg (55 pounds)! This is the preferred food for the orca although they will other species of salmon…..more tomorrow. 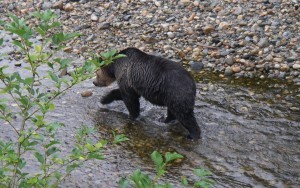 At the same time the grizzly bear was walking up river on yesterday’s post there was another bear in the holding pool fishing. This holding area may have over a thousand salmon in it and some bears get frustrated because the deep water makes it hard to fish. 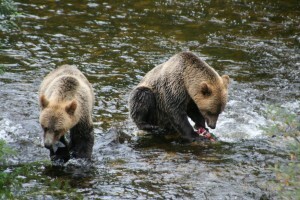 The experienced bears sit and let the salmon swim close or they just pick up the wounded and dying salmon that drift down from the bears fishing up stream. This photo is from the first stand looking toward the second or finger stand. Glen, of the guides, has a good camera and took this photo of a family that had just passed beneath the stands and were making their way along the causeway constantly checking for other grizzly bears feeding the holding pool. The holding pool is where the salmon rest prior to going over the weir to spawn. August 25th is the first day that Grizzly Bear Lodge is permitted to take quests to the viewing platforms on the Glendale River. There are two stands located on the river. This picture is taken from the finger stand looking back at the first that overlooks the weir. The weir is a small dam used to control the water level in the spawning channel that zig zags beyond the weir. If you take time to check the second posting on January 1st 2014, under “Monthly” to the right, it shows a Google map of the spawning channel …more tomorrow. As with most wildlife photography doing nothing is often the best practice. On whale watching safaris from the lodge there is normally allot of activity when a pod of killer whales in located. 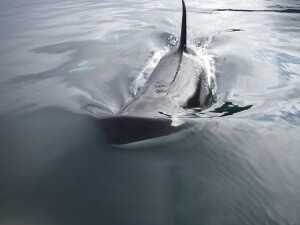 The guides job is to try predict where the orca are going and to try and be there when they arrive and this can be a challenge when they continually change directions. But when there is a full day on the water at sometime there is a good chance of success and then a photo such as this is the result. Taken just before the two orca dove beneath the boat. 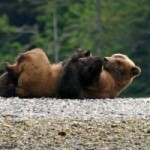 When we have our fall grizzly bear tours to the viewing stands on Knight Inlet’s salmon river it is to view the grizzlies catching and eating salmon. 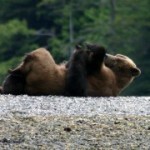 In this photo are two sub-adult sibling grizzly bears. At this age there is no longer the rivalry that occurred when they were with their mother. They are now able to catch their own food and do not share. 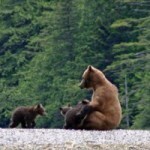 As cubs it was the mother grizzly’s responsibility to ensure enough food was provided to fatten the family to survive the winter now the former cubs are on their own. If you book the extra day in camp we take a forty-five minute boat tour across Knight Inlet through Thompson Sound to the Kakweikan River where spend a day with Trapper Rick. 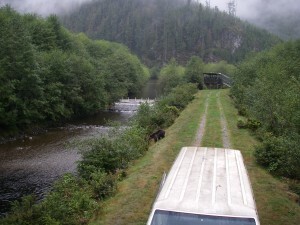 This river is located on the BC mainland where we travel by road to Rick’s cabin. 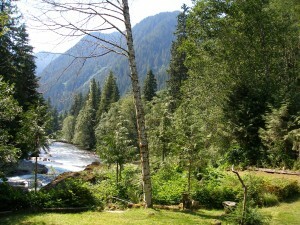 The first photo is the view from the deck of the cabin down the river overlooking the falls. 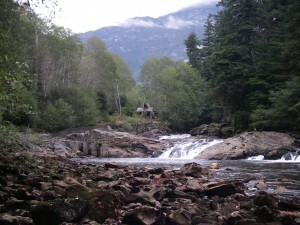 The second photo is from below the falls back toward the cabin. On the left of this picture is the fish ladder built to assist the salmon around the falls that they had been jumping over for thousands of years. (Never question a government when it has money to spend.) 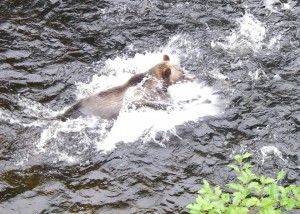 The area below the falls is good for grizzly bear viewing, as it is one of their main fishing spots. We tend to sit on the deck and wait for the bears to appear and also hike to the lower pool another popular feeding area.